Today’s post was supposed to be about Millennials and marriage, but seeing as how the only married writer on this blog will be covering that very subject on Wednesday, it didn’t seem quite right that I comment on it. Palmyra, for those of you who have never had- and now never will- the privilege of visiting, was the ruins of a magnificent and ancient Syrian city. Pristinely preserved, the Roman colonnades, the Persian temples, the Arab fortification all served to transform the city into a dazzling monument to human history. And, when in May of this year, a division of IS scum invaded the neighboring village of Tadmur. In spite of their repellent murder of some 20 locals, I could find no news about what the fate of the ruins was. Some part of me hoped against hope that the thugs (“militants” is far too generous a term) would leave it all be. That there was some flicker of pride in the magnificent heritage of the old place. That even they might still be human enough to appreciate the grandeur of the silent, sun-washed statues and archways. But in the past 48 hours there has come confirmation that demolition has begun. And there are no words. There is nothing that can adequately describe the rage, betrayal, and devastation that this news brings. How do you even do justice to the concept? The knowledge that neither you nor I nor anyone alive or not yet born will be able to walk those streets? Stand in shade of those looming temples? See the citadel silhouetted against the sunset? And what of this man? Khaled el Asaad, the venerable Syrian archaeologist who dedicated his career, his life, to studying and preserving the city of his ancestors? El Asaad helped hide countless artifacts from the IS before his capture. For his defiance, he was captured and tortured, and when he yet refused to surrender the location of the his hidden treasures, executed by beheading. And what is there to say? I’ve said that ISIS can’t last. And I believe that every bit as much today as I did when I first said it. But while their infidelic, feculent little hour is doomed to end, it hasn’t yet come. 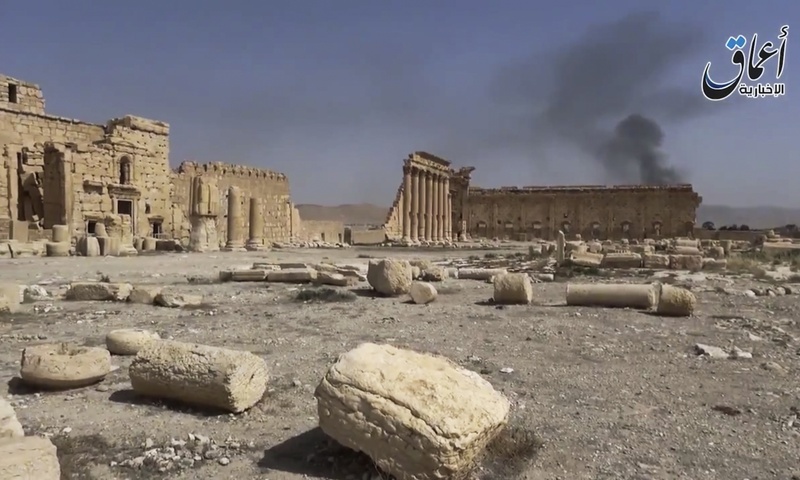 And while Palmyra lies being blasted into oblivion, I’m just sitting here in underwear, in my dark and dirty room, trying to think of something- anything– that doesn’t mockingly ring of helplessness and futility. So what am I supposed to say, readers? What the hell can I say? This entry was posted in crime, morality, news, politics and tagged Abassid, Arab, art, Artifacts, Beheading, bombing, city, Collonade, death, execution, Greek, IS, ISIS, Islamic State, Khaled el Asaad, murder, Palmyra, Parthian, Persian, Roman, Ruins, Syria, Tadmur, Temple, Ummayed. Bookmark the permalink.